Switzerland 1979. 16, b/w, min. After the experiences about which my parents spoke in the Swiss film "Emigration" after over twenty years spent as foreign workers in Switzerland, this second part of the film shows their (and my) place of origin, the village of Acquaviva Collecroce in Italy. My parents will soon return there for good, to the very place they left so full of hope many years ago. Time has not stood still in the village: newroads have been made, the church has a new steeple, new houses have been built, a new generation has grown up, and my parents know only their relations and their closest neihbours in the village. 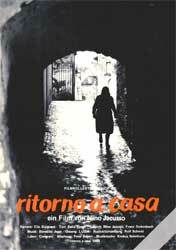 "Ritorno a Casa" deals with the fear felt by emigrants who, after being strangers for so long, are once again strangers, this time in their own country.